Welcome to The Emerald Roadhouse, home of Belfast newest entertainment complex. Set in the leafy suburbs of Belfast, The Emerald Roadhouse is a jewel hidden in plain sight. Just off the Finaghy cross roads adjacent to the Finaghy train station, The Emerald roadhouse is nestled away in a quiet corner, perfect for a hearty feed, of food (or drink). With the best in Live Entertainment 7 Nights a week, The Emerald is your one stop place for a great evening out! Opened in March 2010 it has been Belfast best kept secret for great food, great drink, and always great Craic, and that%u2019s just a Monday night! Reopened on the site of the old Devenish Arms Complex, the Emerald Roadhouse has had an extensive refurbishment, with five bars to choose from, Cleary%u2019s Family Friendly Restaurant, the Grand Ballroom, not to mention the newly opened Bridge theatre Suite. Easily accessible, warm reception, service and very competitive prices for a night out with the versatility of five different nights to be had under one roof. Have you got Google Earth on your computer? If so, then download the Google Earth view of The Emerald Roadhouse. Is this the wrong position for The Emerald Roadhouse? If you think so, then modify its position. Click / Tap the button above to get directions from where you are to The Emerald Roadhouse. Forgot to add they now have a big screen in the ballroom for all the football. Happy days, wish i had that in my house. Will be back with few friends to watch the Euro Football. Gonna be some good nights ahead for the lads. started revisiting the emeraldroadhouse as it is known now, and i love it. Like any place one goes too, someone will always find some fault at some stage. You also have to take into consideration these days,lack of cash and what bars/restaurants have to do to get customers in the door. Hard times for everyone - if anyone forgets. **** The emerald roadhouse opened on the 5th of march 2010 !!!! any review previous to this should be disregarded, opened under entirely new management and staff, completely refurbished and re invented, you can see the difference on the comments look at the dates on comments !!! Went to the new Devenish the other night and had a meal in the restuarnt. Staff were really friendly, the food was unbelievably cheap but it was really lovely. Really nice to see how its changed for the better. Will be going back again def. 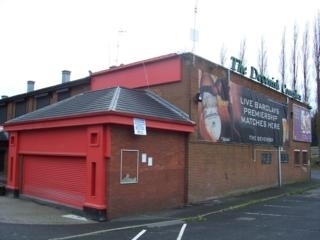 I was in the Devenish the other night and it was packed. I would say it was the best night I have had in a long time. Music good talent great. Doorstaff very polite and friendly. Barstaff wearing green bar coats with black collars and I think some of the names were Wooly kevin, Paddy, Jim and Joe. You just clicked I was dreaming that I was back in the easrly eighties. I was in the "DEV" at the weekend on a works night out and we had a good night. New dj music was great. They have changed the bouncers too alot of older bouncers on there now sound to talk too and even got us taxis. They are kinna strict on ids only took liceneces and passports no student cards so my mate had to go home and get her licence. Bar staff were fast too no ques at the bar like i used to remember. Anyone know what types of id the dev accepts? are student cards accepted? Stinkin hole, door staff are bullies, staff are ignorant. That's before we sat down for our food, yuk. Will never be back. Drinks are really overpriced and staff aren't shy on short changing you. its a dirty ole hole staff r cheeky, bouncers r glorified door frames on a power trip. ur only gaurente with the dev is fight outside after throwin out, its the only thing that keeps ppl occupied while w8ing 3 hrs on a taxi 2 get home. Prob the best place in West Belfast to see hilarious fights between the bouncers and plastered fellas, I'd recommend the bottom bar just for this. Drinks far too expensive, gd atmosphere in the bar tho. Full of kids, especially in the club. You'll go home with a bustin head afterwards. Went to the dev saturday night dirt and glass evey where the staff was not very nice i will not be going back. devinish is great. i go every week and always ave a brillant time! stench of urine flowing from the constantly blocked toilets. the beers luke warm and the bar staff are absolute ********. the general population of the bar regulars are usually tracksuit wearing *********.